My favorite recordings are those who are many hours long. Even in places where I hear „nothing“, I will more often end up with expressively moments. 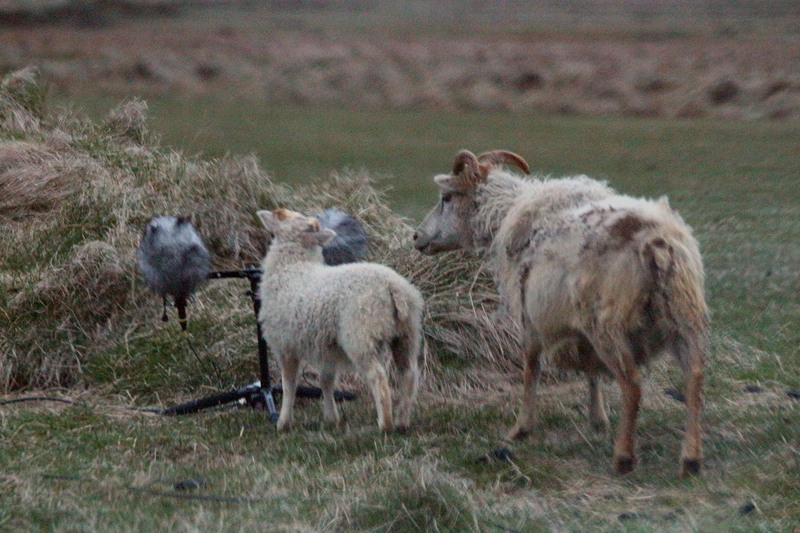 Here is one of these moments when curious sheeps are sniffing, licking and biting the microphones. Not very interesting, but anyway the loudest part of seven hours long recording. It was recorded in Álftaver, in the south east south of Iceland, around midnight, 4th of June 2015. Mitt skemmtilegasta viðfangsefni eru langar upptökur úti í náttúrunni. Jafnvel þó fátt makrvert heyrist, þá er oftar en ekki eitthvað áheyrilegt í þessum upptökum. Hér er ein slík uppákoma þegar rolla og lambrútur snuðra við hljóðnemasettið. Þetta er ekki merkileg upptaka en engu að síður háværasti parturinn úr sjö klukkustunda langri upptöku. Þessi hljóðpartur var tekinn upp um miðnætti í Álftaveri þann 4. júní 2015. Við lifum einkennilega tíma. Við þurfum að taka MJÖG rótækar ákvarðanir og breyta lifnarðarháttum okkar miklu meira en flestum likar. Ekki einhvern tíma seinna, heldur NÚNA. Segja má að Loftslagsráðstefnan í Paris, COP21, sé mikilvægasta ráðstefna sem mannkynið hefur upplifað. Að því tilefni voru farnar kröfugöngur víða um heim þar sem ráðamenn voru hvattir til að gefa ekkert eftir í þeim efnum. Ein slík ganga var farin í Reykjavík einn kaldan vetrardag, sunnudaginn 29. nóvember 2015, á vegum náttúruvendarsamtaka. Heppnaðist gangan með ágætum þó fleiri hefðu mátt taka þátt í svo milivægri kröfugöngu. Hér er hljóðrit frá seinni hluta göngunnar sem og frá Lækjatorgi þar sem haldnar voru ofur stuttar en mjög góðar ræður. We live in a strange time where we must take a very radical decisions and changes in our lifestyle. Therefore, is the UN climate change conference now in Paris, COP21’s the most important conference that mankind has ever experienced. For this occasion many march or demonstrations occurred in cities all around the world where the leaders in the conference were encouraged to make a very radical agreements. One such climate march was gone in Reykjavik in a cold Sunday, November 29th, 2015. The following recording includes the second half of the march and two short speeches in the end (in Icelandic) at Lækjartorg square in Reykjavik center. Weather : About -4°C, calm.